Jiang is from Nanchang, Jiangxi province. Born in the 70s, Jiang is a professional artist and currently residing in Guangzhou. “Jiang is an icon, both mentally and physically,” said art critics. “She loves art and enjoys painting. At the same time, she is more than an artist she is a leader as well. 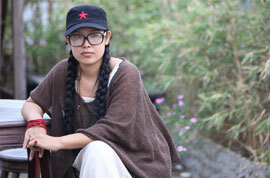 Jiang uses her spare time to promote art and encourages people to appreciate works of art,” added art critics. Jiang belongs to a group of forward thinking artists who called themselves “The New Wild Surrealism”. She is a director of the Guangzhou Xiao Zhou Cun Artists Union, a member of the Guangdong Artists Association and the Guangzhou Artists Association. During the period from 2009 to 2015, Jiang had participated in 12 major art shows and competitions. In 2010, Jiang’s painting “Mother of the Land” was awarded a certificate of merit. In 2012, Jiang was honored by the National Oil Painting Institute as one of the most outstanding young artists of the year in the country with her painting titled “The Vision”.